View More In Soldering Guns & Irons. 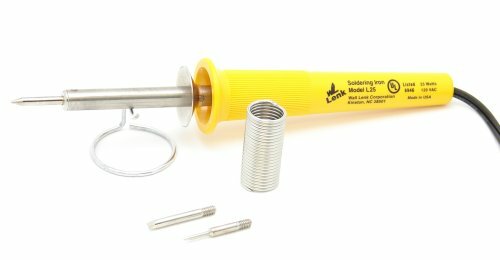 Wall Lenk L25K 25 Watt Soldering Kit features a small, lightweight iron great for fine soldering applications such as fine wiring, electronics, and hobbies. Pencil style provides better control and handling. Impact resistant polycarbonate handles and stainless steel shaft for durability. Mica insulated nichrome heating element for efficient heat transfer and tip temperature. Maximum tip temperature - 900DegreeF. Includes: 25 Watt, 120 VAC, 2-Wire Professional Soldering Iron, Three Points: L25PT Pointed Tip, L25CT Chisel Tip, L25FT Fine Tip, 1/2 Ounce Lead Free Solder, Tool Stand, Instruction Sheet. If you have any questions about this product by Wall Lenk, contact us by completing and submitting the form below. If you are looking for a specif part number, please include it with your message.